Thanks to the Maine.gov feed of Maine-specific BLS unemployment data, it was easy to construct a chart of unemployment figures over time. It can be hard to see this as clearly with all sixteen counties, so I’m just showing the most and least fortunate counties in terms of unemployment figures here. In addition to the huge gap in unemployment percentages, note also how seasonal unemployment is in Washington County, relative to Cumberland County. Employment is work that up to 7% of county workers have only for a few months at a time. 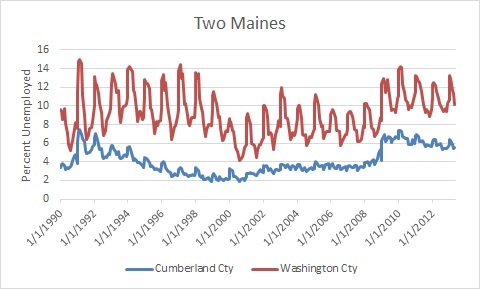 Look at the long lag after Cumberland County experienced lower unemployment in the 1990s before the unemployment rate was affected in Washington County. Washington County missed the Clinton-era boom altogether. How long will it be before their current recession ends? And which Maine are you in? This entry was posted in Maine Economy, Municipal Finance, Two Maines. Bookmark the permalink.